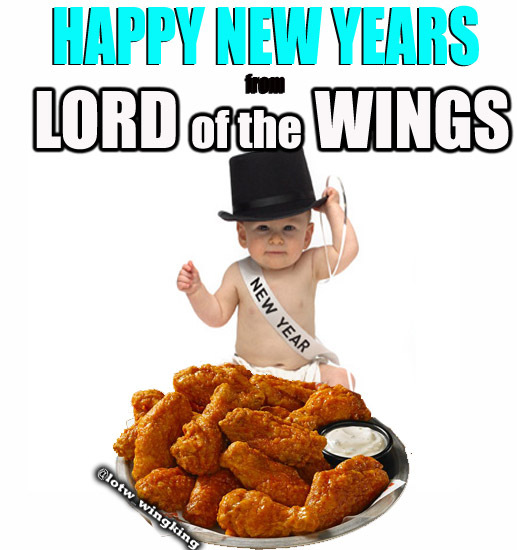 May your 2019 be full of wings. Giant, bigger than a baby sized wings. Happy New Years! 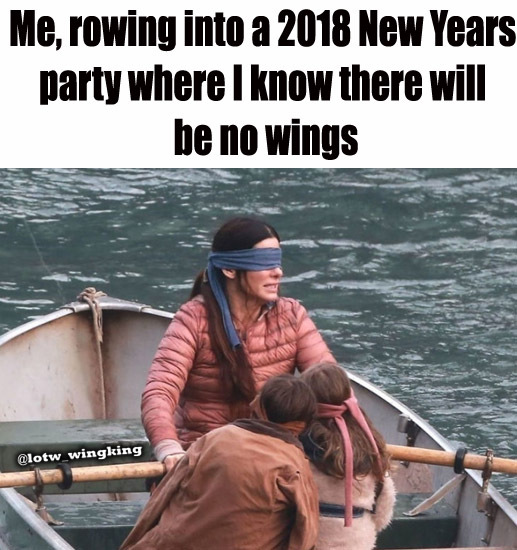 I have no idea if this meme works because before today I have never heard of Bird Box before. Then BAM, all these memes. Either way, Happy New Years!!! With LJ away on a work trip I was on my own for a few days. We had just moved and I spent most of my time unpacking the house (personal update, the house seems to still have not been unpacked weeks later despite emptying many boxes). 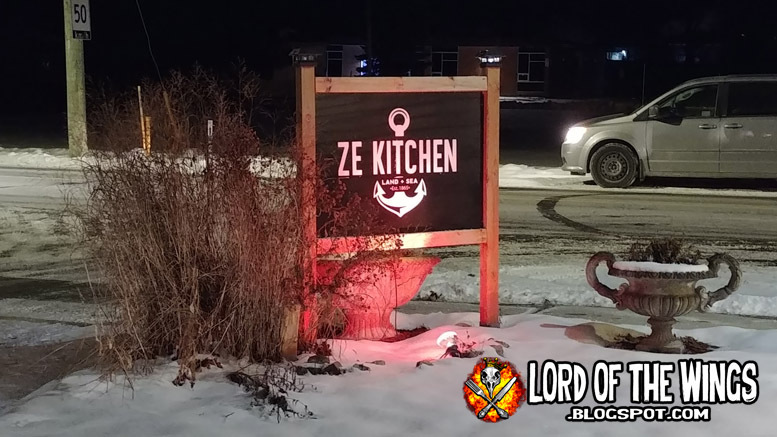 One of those nights I decided I needed to get out of the house and I decided to check out a place out of town I've been keen on trying for a while: Ze Kitchen. Ze Kitchen (I don't know if the place is pronounced Ze like 'the' or Ze like 'zee') is located out in Cumberland Ontario, about 30 kilometers east of Ottawa. 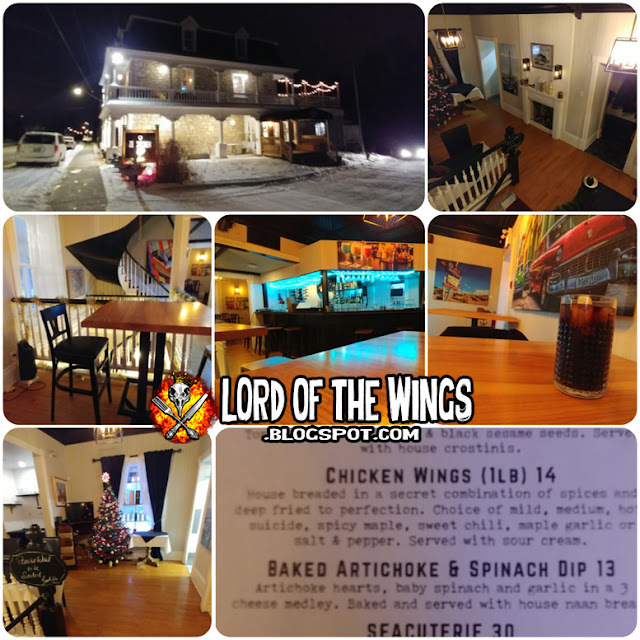 I became aware of this restaurant after seeing their advertisements on Instagram for Thursday wing nights earlier this year. I had intended to go much sooner, but things never worked out to do so. 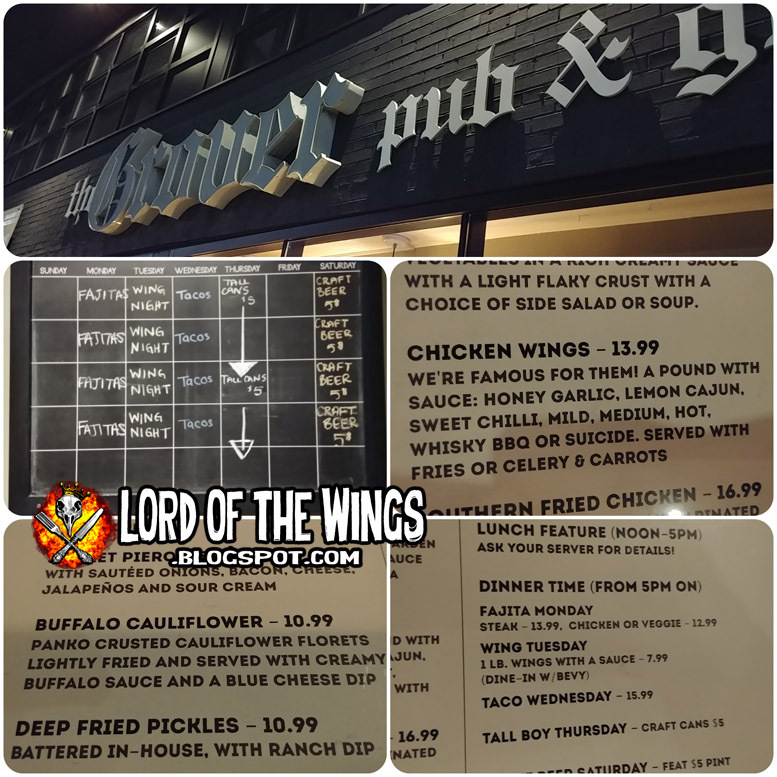 I was a little hesitant to go dine solo because it seemed like a fine dining type establishment and I was looking to just do wings, but I thought, what the heck let's do it. The place only opens at 4pm, so I decided to go for 4:30 so that I was in before the main dining crowd. I got there at 4:30 and the place was deserted. 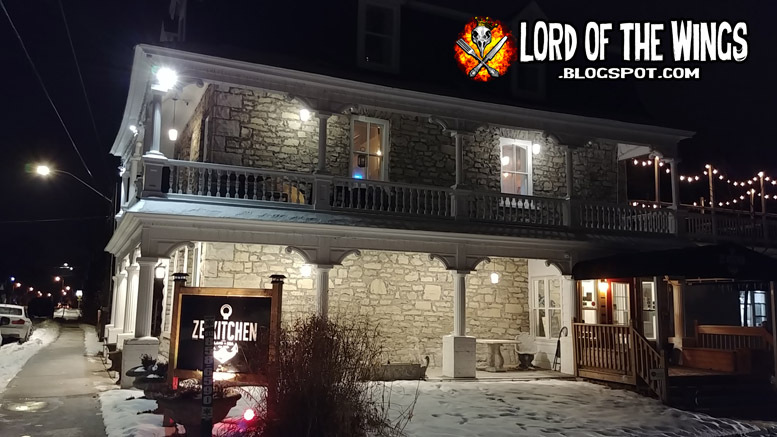 The building was originally built close to if not more than 100 years ago by a doctor for his home and practice, but it has been many different things over the years before becoming Ze Kitchen. I walked into the main foyer and waited to be seated ... but nobody was around. So I stood around for a few moments, feeling a little awkward, despite having heard the little chimes that go off when someone enters. The place was decorated for Christmas and had a rustic but also modernized charm. Someone else came in a few minutes later behind me and I thought oh no, I'm going to have to uncomfortably explain I'm not with them. It turned out to be my eventual waitress. While she came in and was taking off her coat, another staff member came down the stairs and he awkwardly asked if he could help me, as if it were unusual for me to be there. I said I was there to eat and he seemed surprised. He was about to take me to the main floor dining room, but then asked if I wanted to dine in the bar upstairs. I thought that would be great. The bar area is in the main landing of the 2nd floor, where there were a few tables (he sat me at a table next to the one he was working at a laptop) but there were a few smaller dining rooms in what were probably bedrooms at one time. It also had access to a balcony patio area (closed for the season). The third floor had washrooms, but also a couple of more dining rooms. This was a big place. The waiter gave me a menu but also let me know that it was wing night. I knew this already, but it was good to have confirmation. Not long after the waitress came and took my drink order, as well as my wing order. She was friendly and very professional. Over the course of the evening I watched two separate groups arrive for supper, but otherwise it was pretty quiet. 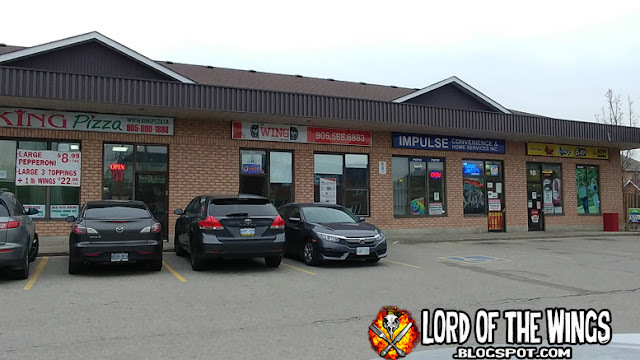 I get the impression that this place is kind of out of place as a finer dining establishment in a very small town with the only other restaurant is a take-out pizza joint. 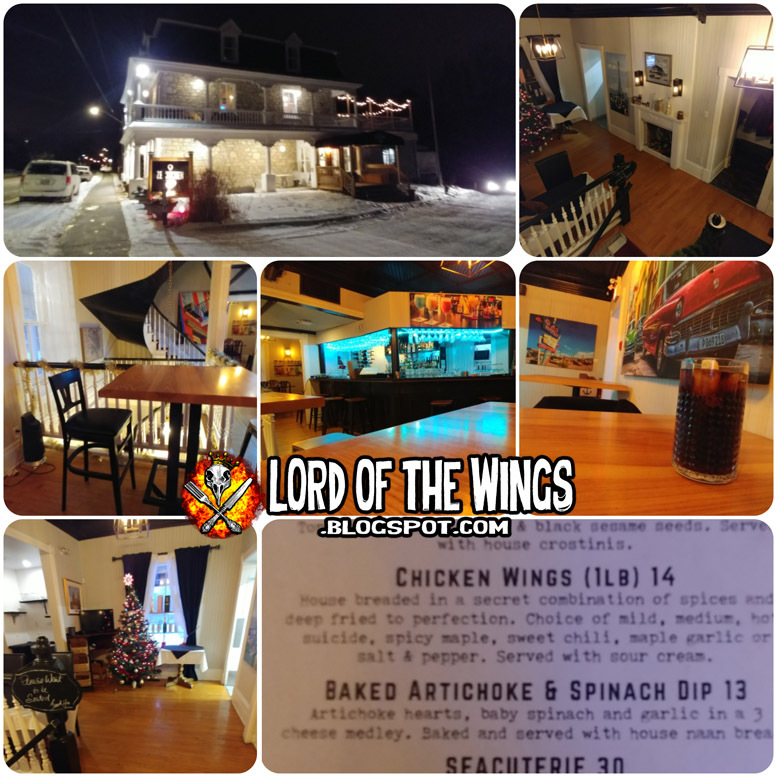 My guess is that they have burger and wing nights to get the locals in who wouldn't normally come out for fancy fare, but it's too far from Ottawa for the city crowd to come to. I sat and worked away waiting for my wings. I didn't have to wait long, but because I was in the bar area, as were the staff (including the chef who came out and sat at the bar) I inadvertently got to listen in to their workplace conversations. Fascinating! Right off the bat, I had some issues taking photos. Before my food arrived, I had the bar area to myself pretty much. As soon as the food came, BAM! all 3 staff hanging out there. So trying to sneak some pictures was very difficult and so I didn't take that many and the lighting was low and I couldn't take my time. After getting home and uploading them to the computer, they don't look so bad, so I guess that was ok. I glossed the menu explanation and didn't even pay attention to the fact that it states "Served with sour cream" because I would have subbed that out for anything. 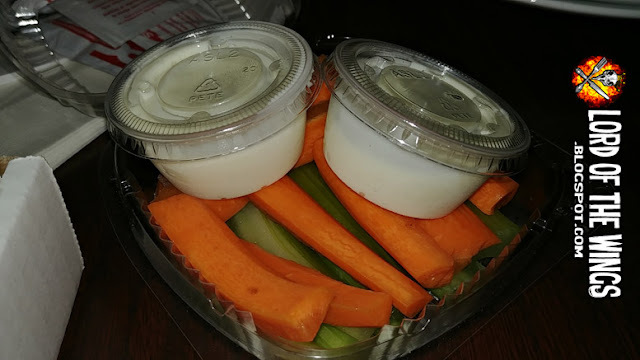 Because I got two orders of wings, I got to big ramekins of sour cream I didn't want. 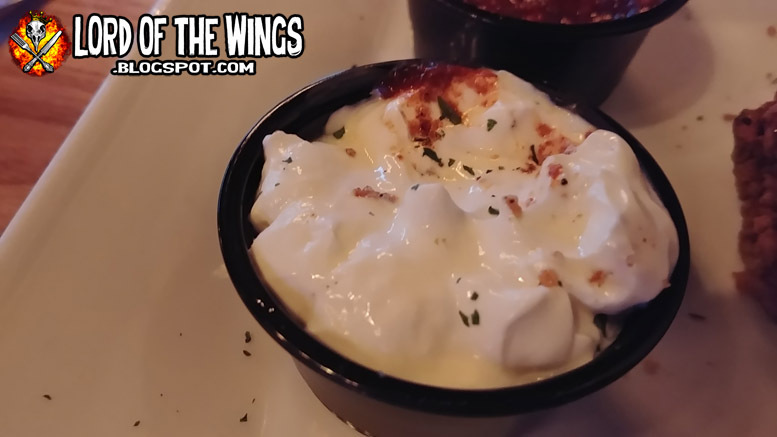 The sour cream is plain, but in the photo above you can see where some of the spices from the wings brushed off when I did dip them. I was not expecting the giant wings I got. They were a large wing to begin with (both in length and meatiness) but they are also breaded that makes them even bigger. These wings are "House breaded in a secret combination of spices and deep fried to perfection." 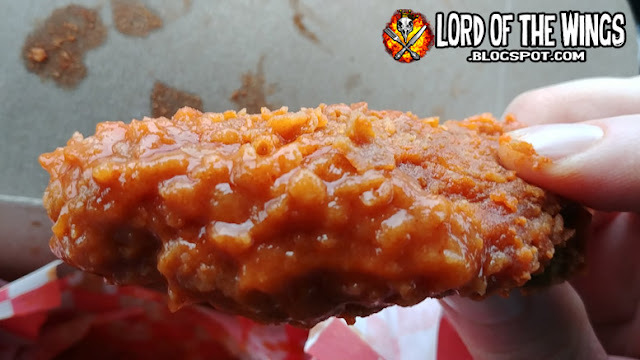 So there is a suit of armor of breading around these wings; if you are someone who doesn't like breading these aren't for you. 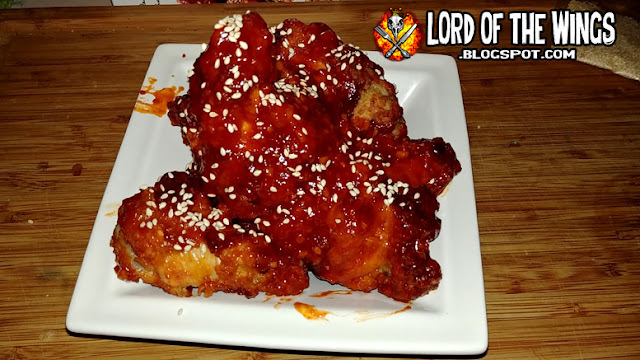 I actually thought the wings were overcooked and burnt when I first looked at them. They were a dark brown and that didn't seem to be good. But the breading turned out to be quite tasty (a little salty but also seasoned with other spices) and not like any I've had on chicken before. 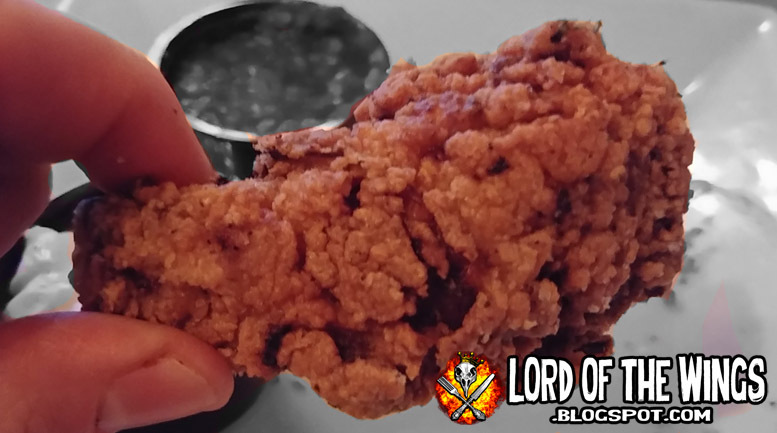 It is thick, but not so much so that it takes away from the chicken. It's very crunchy and has a great texture. Although I got one dry order of wings, the sauced ones were wet and well coated in sauce, but the breading really held up well against it. 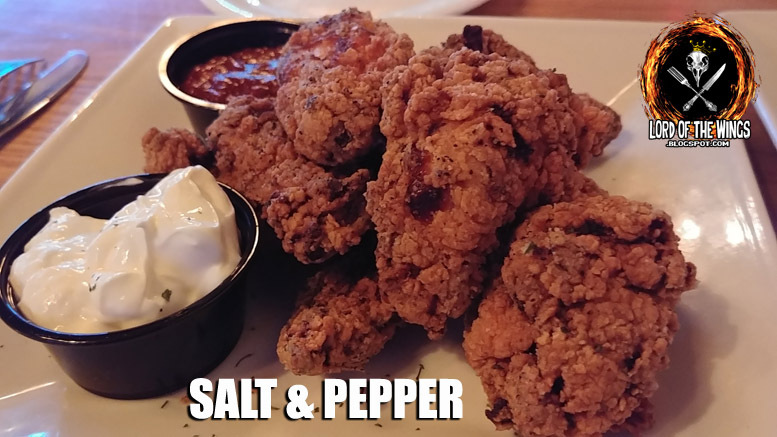 There were several flavours that sounded unique but just didn't speak to me (spicy maple, sweet chili, maple garlic) so I went with classic Hot, but also an order of dry Salt & Pepper wings, with a side of Suicide. These were good. The sauce is simple; cayenne based hot sauce (probably Frank's) and maybe a bit of butter? It's good. 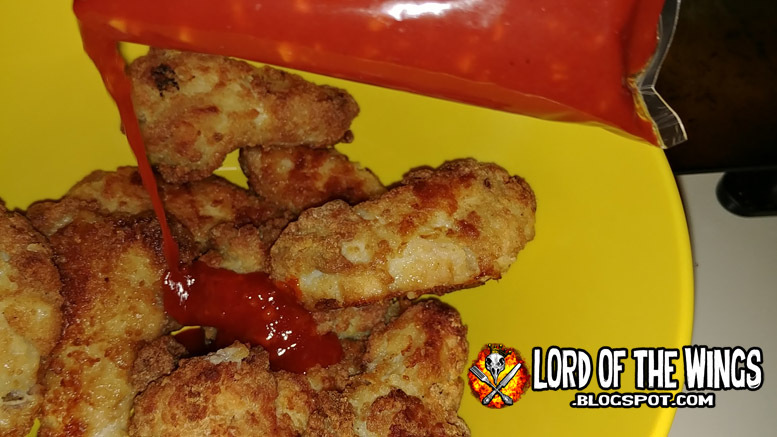 It has a little heat, but it goes well with the season breaded chicken. S&P worked really well with the breaded skin. Really salty, only slightly peppery. 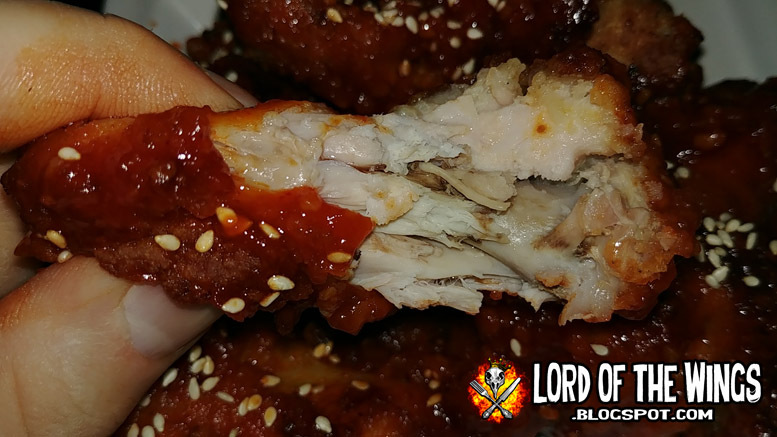 I liked it, but a dipping sauce on the side is a must. Don't let that be sour cream. This looked and smelled promising, but once I tasted it I was not into it. You can make this at home: take a tin of chipotle peppers in adobo sauce, chop or whiz the peppers and return to adobo sauce, that is all. I really love chipotle and I love the adobo sauce they come in - I add that to homemade hot sauces, chili and other things - but as a sauce on their own I did not enjoy. The pro's is that the heat is good, and you get that smokey flavour. The sauce is thick and chunky too. But the flavour just didn't work on it's own without a more liquid base, maybe with vinegar or butter as well. 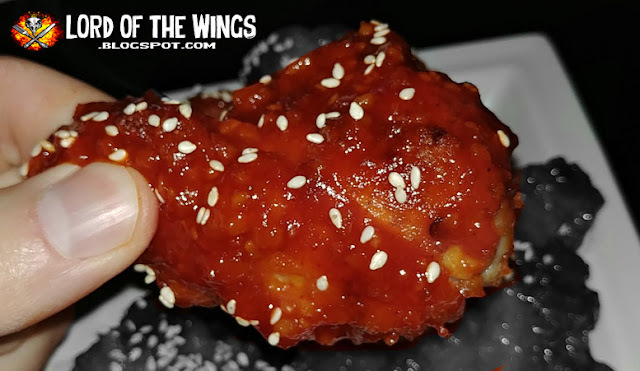 However you pronounce it, Ze Kitchen does some unique and tasty wings. 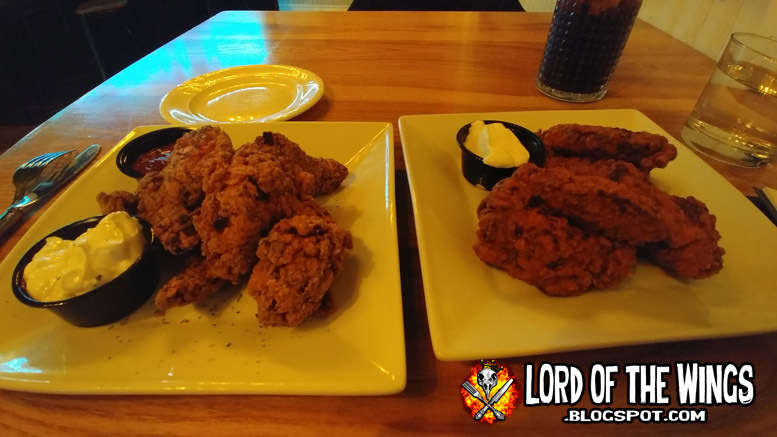 Larger than I expected, crunchy breading, and good flavoured wings. Hot was tasty, Salt & Pepper was great with the dry wing but a dip helps. Suicide was just chipotle in adobo sauce, but it was just too much and was too thick. I had a slightly awkward dining experience, but I would say overall Ze was worth the drive out to Cumberland and I would go back for wing night again for sure! 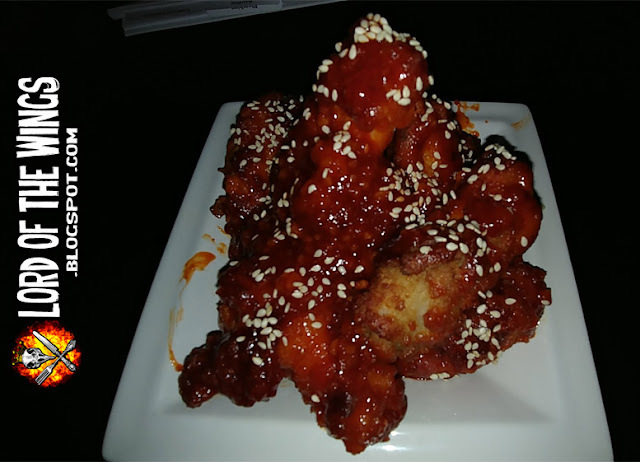 The biggest trend in chicken wings in the last year or two has been Korean chicken wings. 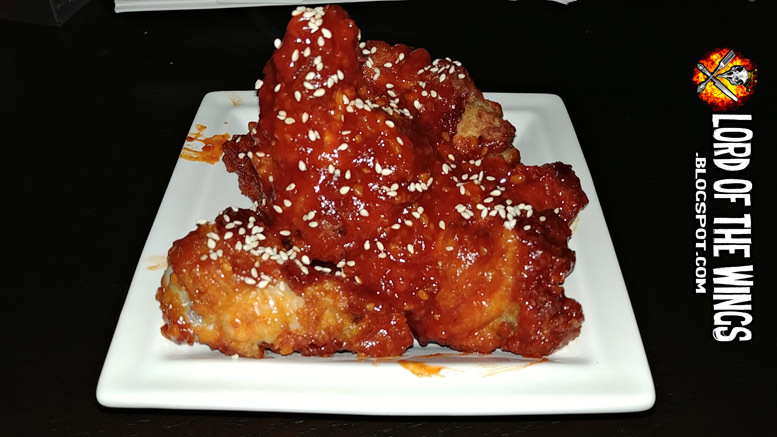 In most cases, this has been focused at Korean fried chicken but North America has slowly been exploring gochujang (a spicy pepper paste). 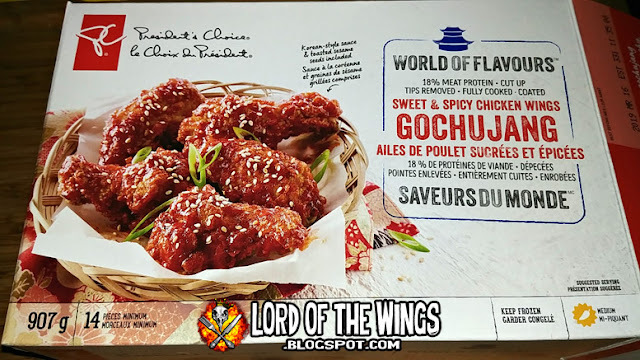 President's Choice has always been pretty bold in trying new flavours and I was excited to see them take on Gochujang wings. These wings were on sale which prompted me to get them to try. They were on for $10, when they average about $13-15. The box had some interesting points on it: 18% meat protein (only 18? 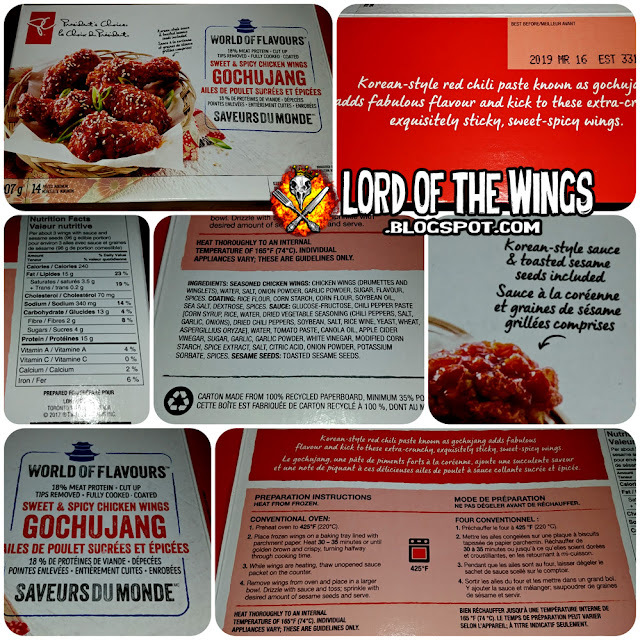 ), tips removed (never seen this advertised on frozen wings) and that the box says 907g but emphasize that there are 14 pieces minimum. 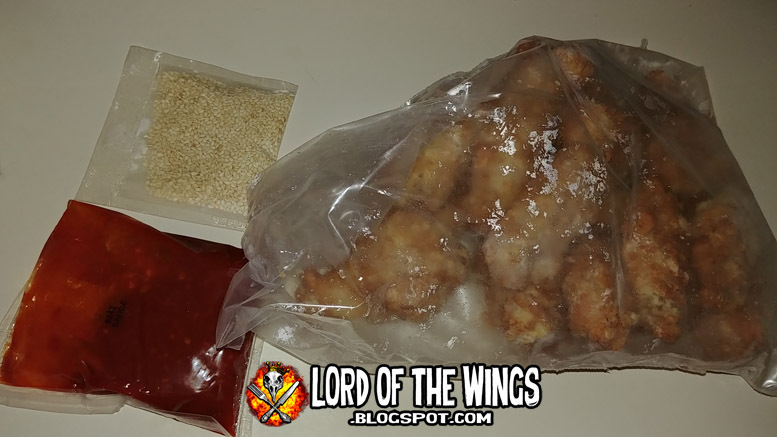 Within the box is the bag of wings, a packet of the gochujung sauce, and a bag of toasted sesame seeds. Because there is only one sauce pack and the super light seeds, that means there is more wing meat than most of PC frozen wings. I opened the bag and noticed there had been a little bit of freezer burning. There were a lot of wings and I ended up not making the whole bag, which meant I was going to be using all the sauce on one round of wings. The wings are breaded and fully cooked, so they only take about 20 minutes to cook (the box says 30-35 minutes at 425 degrees, but I didn't need that long). I flopped them at the 10 minute mark. While this was cooking, I put the frozen bag of sauce in warm water to thaw. 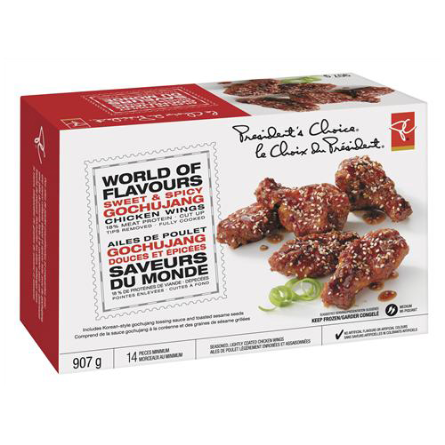 These seemed to be bigger than average sized PC frozen wings, a pleasant surprise for sure. Once the wings were done I put them in a bowl and cut open the gochujang sauce packet and drizzled it over the wings. The sauce itself was viscous but not that thick. It streamed pretty well out and over the wings. 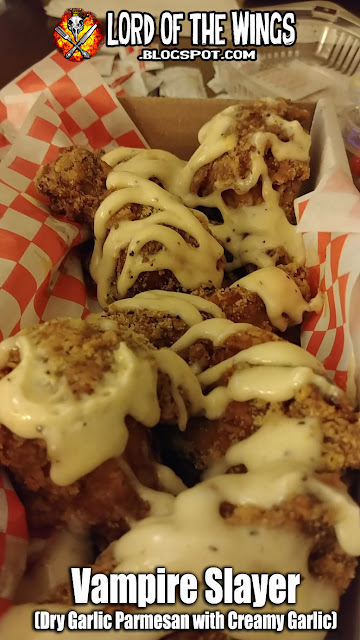 Because I didn't cook all the wings, only about 9, there was ample sauce. 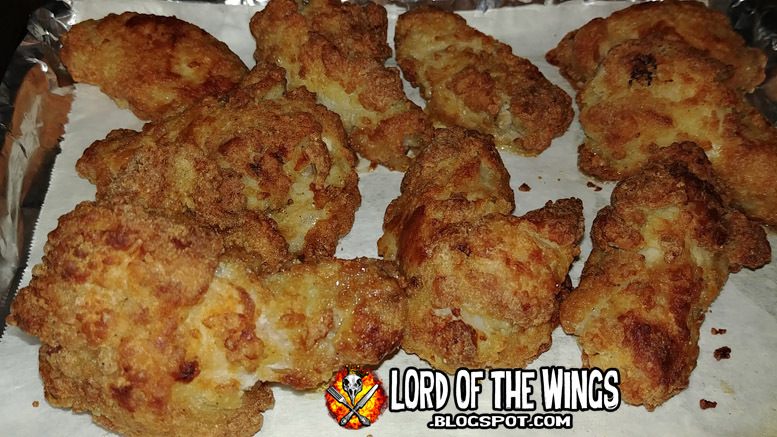 I tossed them up to make sure the wings were well coated. I cracked open the sesame seeds and maybe used 1/3 of the pack, and even that was more than enough. The seeds feel more aesthetic than anything, but my wings did look a little more elevated in status than old fashioned hot wings. Visually, these wings looked pretty exciting. These were very meaty wings. 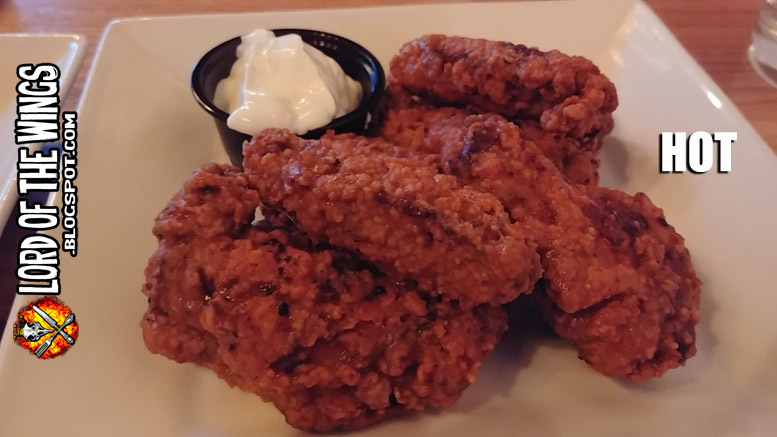 Yes they had breading, but they were still big wings. The breading was ok, and seemed to be double breaded (like a Korean Fried Chicken piece) but the finished cooked wing didn't give a really nice crispy skin. The meat was tender enough. The chicken overall was just ok. But these wings were going to have to rest on it's sauce. And the sauce was where the trouble really began. 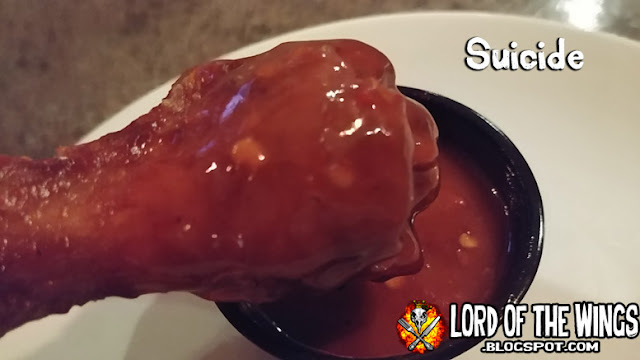 The sauce was good and not good at the same time. There was something very bitter in it - it just ruined the whole flavour profile. The sauce is sweet, it's slightly spicy, but that sour, bitter flavour just wrecked the whole thing for me. Yech! I don't know if it's off garlic or what specifically it was but no thank you. The double breaded chicken was ok, the sesame seeds are a nice touch, but the sauce has something in it that is bitter and sour and wrecks the fun for the sweet/spicy side of the sauce. As someone who has eaten Korean wings, and made Korean wings, these don't taste like they should and are a big thumbs down for me. Too bad. I only had part of an evening, but I was going through Toronto and my 'Halifax Crew' (I call them this because when we all used to work together we went to a conference in Halifax and tore up the city. We do not collectively call ourselves this, and I don't think I've spoken it out loud to them, but this is externally what I call us) we up to the last minute challenge of getting together for dinner. Since we all seemed to like it, and it's close to 2 of 3 of their homes, we went back to The Grover. We've been to The Grover before, back when I was just about to move from Toronto to Ottawa in 2016 - I didn't do a full review, just a mini one in my Year End Reviews, and I had the wings and they were pretty good. 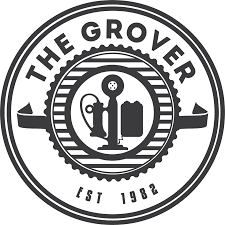 History note - I was curious why the place was called The Grover and their logo has a telephone on it. Turns out they are named for the Grover Exchange Building which is the next building north, where Bell Telephone of Canada company had Canada's first automatic telephone exchange. Neat! Heather, Helen, Me, Adam. Not clearly seen but present is little baby Miri. 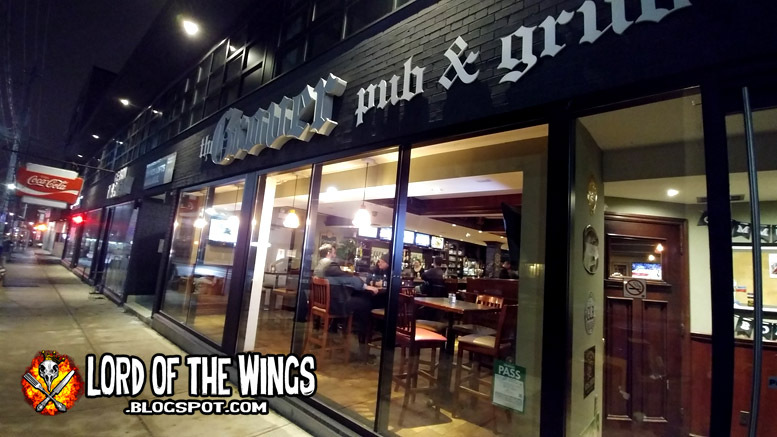 The Grover is a very friendly, neighbourhood pub that want's to create a family feeling. Helen even brought her Baby Miri with us and she slept soundly the whole time, even with a crowd watching I want to say a hockey game? Some sort of sporting event anyways. Our waitress was Christine who was great. To accommodate our party of 4.5 she brought over a table and took good care of us. She brought us all waters, and re-filled my Diet Coke as necessary. 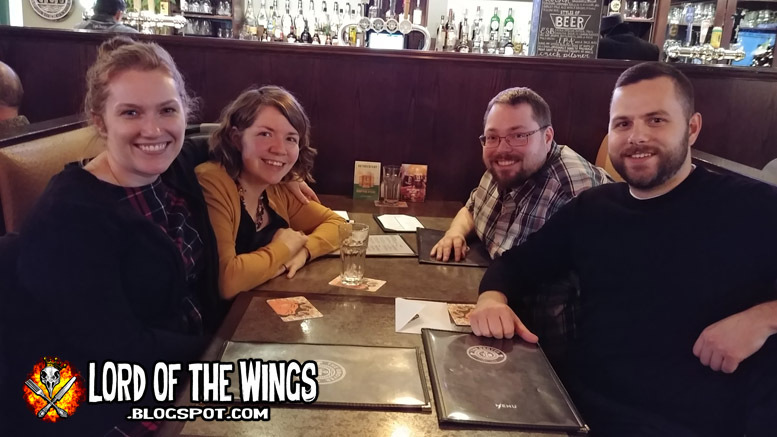 A happy coincidence was that we were there on Wing Night. Heather was coming from a work dinner so she didn't eat, but the rest of us all ended up getting wings. In terms of the review, and I'm not too sorry about this, but I spent more time engaged with friends I've missed and chatting than taking photos for the review. I usually snap between 10-20 pics and edit out the best, but I was having such a good time that I barely got the basics. Sorry, but not sorry as friends are more important. 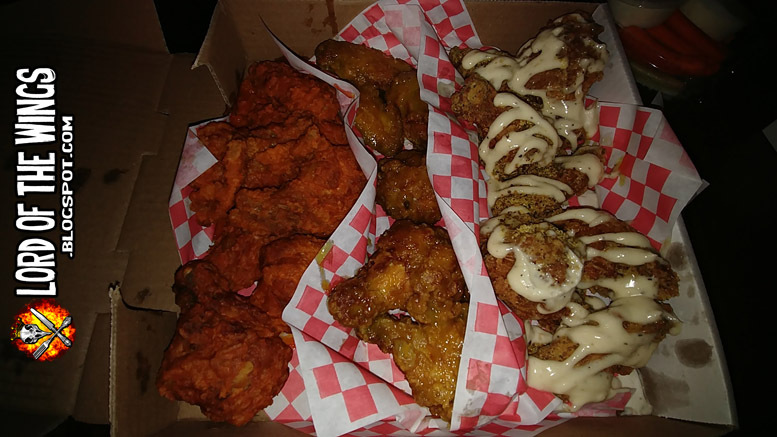 A usual order of wings comes with a choice of fries or veggie sticks and dip. 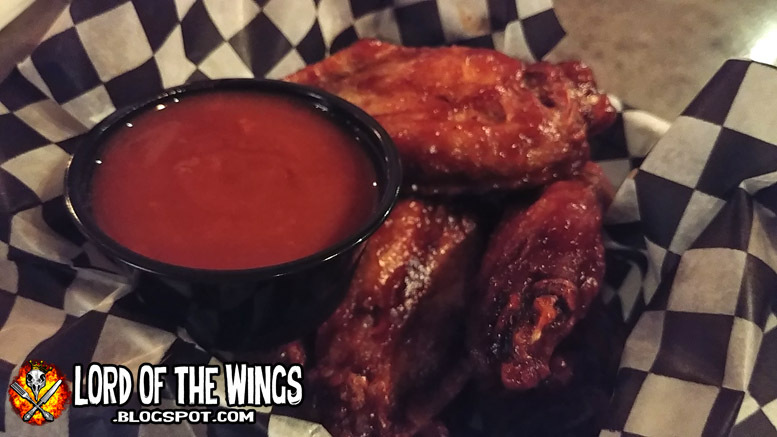 But since this was wing night (Tuesdays, dine-in only with beverage purchase), they are only the pound of wings. 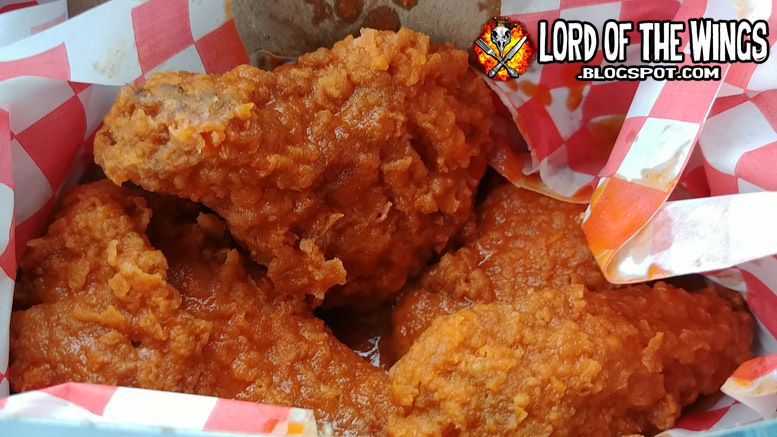 A pound of wing here is roughly 7 or 8 wings. I didn't take a photo to gauge the size of the wings, so I dove into my archives and found this photo. 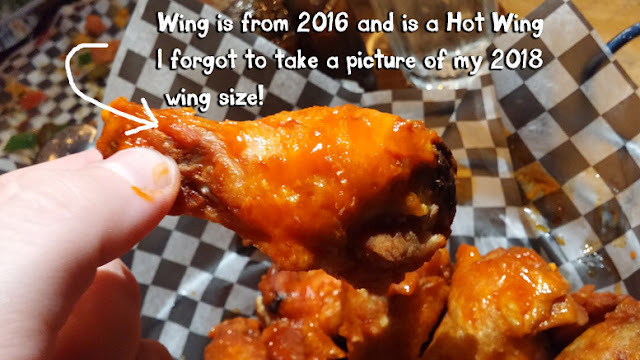 It was of a Hot wing from 2016, but you get the gist. The wings are about a medium in length and they are about a medium in meatiness too. 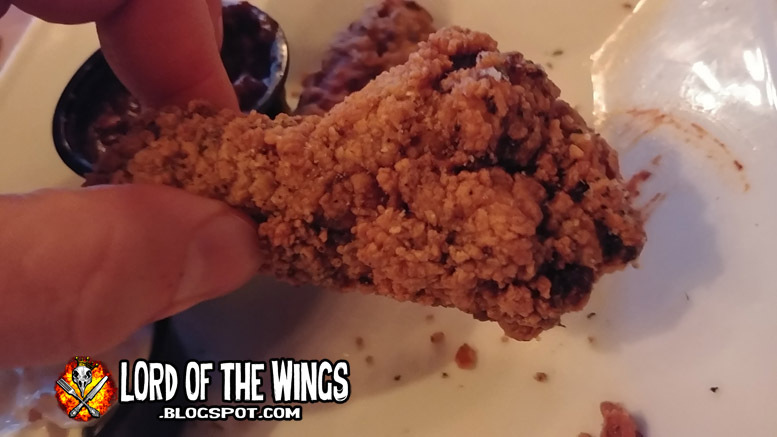 The wings are deep fried and are nice and crispy, however on this trip Helen correctly pointed out that they were a big overcooked. That didn't make them bad, but the meat was a bit tough. 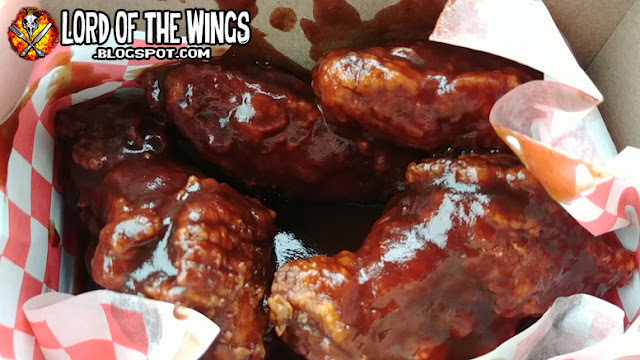 The sauce also had an almost baked on quality, but the wings were well coated in sauce. I decided to stray from my usual Hot since I had had it the last time, and while good, was just cayenne hot sauce. Whisky BBQ sounded interesting and I'm glad I got it. They were slightly sweet, but more of a savoury BBQ sauce. They were also sticky and thick. It was really good and had an actual BBQ kind of feel. Got this sauce on the side. 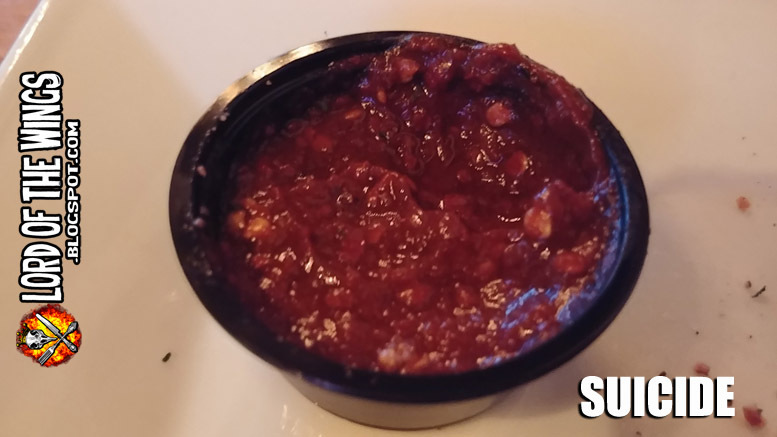 It was a nice red sauce and you could see chili seeds floating around. It was cayenne based, but it might have had scotch bonnet peppers in it? It had a nice burn and was surprisingly a real suicide sauce. Blurry secret photo I took. Adam is enjoying his wings, not angry, as it might appear. The Grover is a cool little pub in the Upper Beaches of Toronto. Very welcoming place, friendly staff and good food. The wings were good and I would definitely get my combo of Whisky BBQ and side Suicide again. 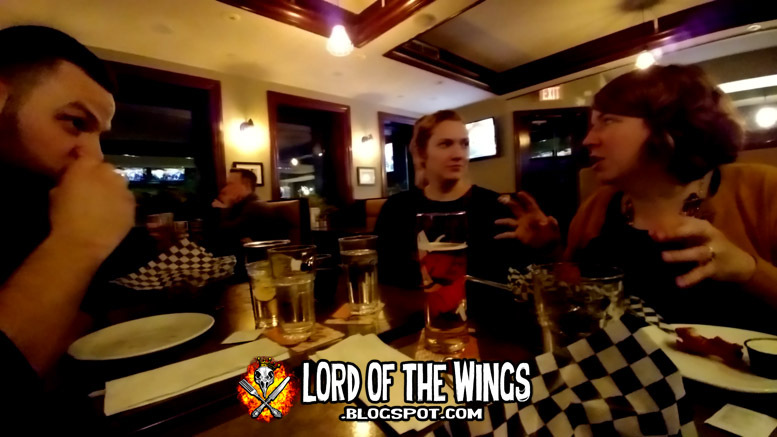 It was really great that my friends could all get together, catch up and enjoy some wings while I blew through the city! So I was in Mississauga the other week. Yes, if you have been noticing, I have been on the road lately and have been scrambling to finish all my reviews. 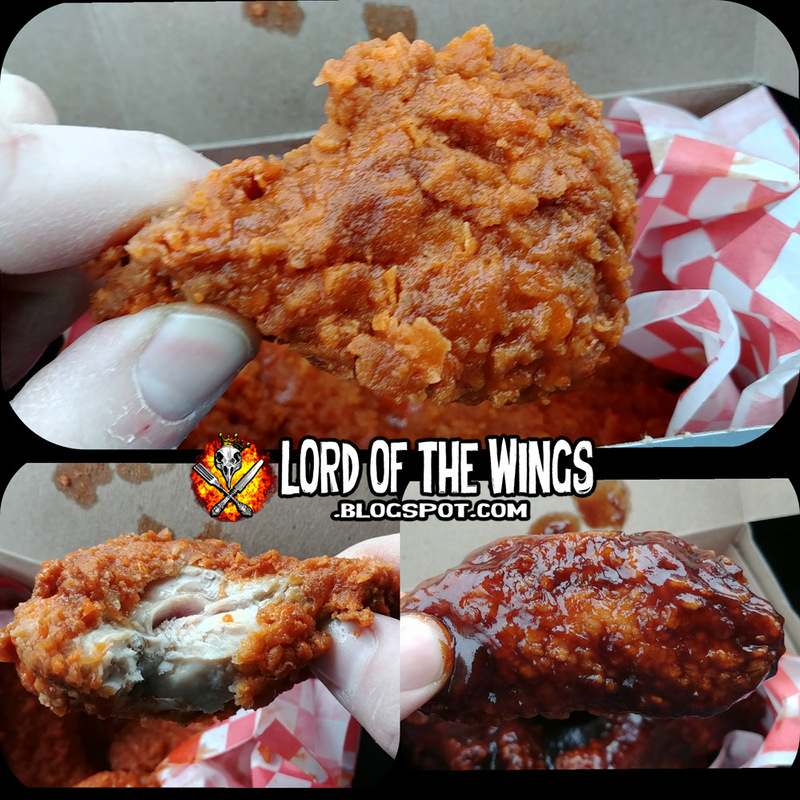 But the good news is that means I have had the opportunity to sample more wings across the province. 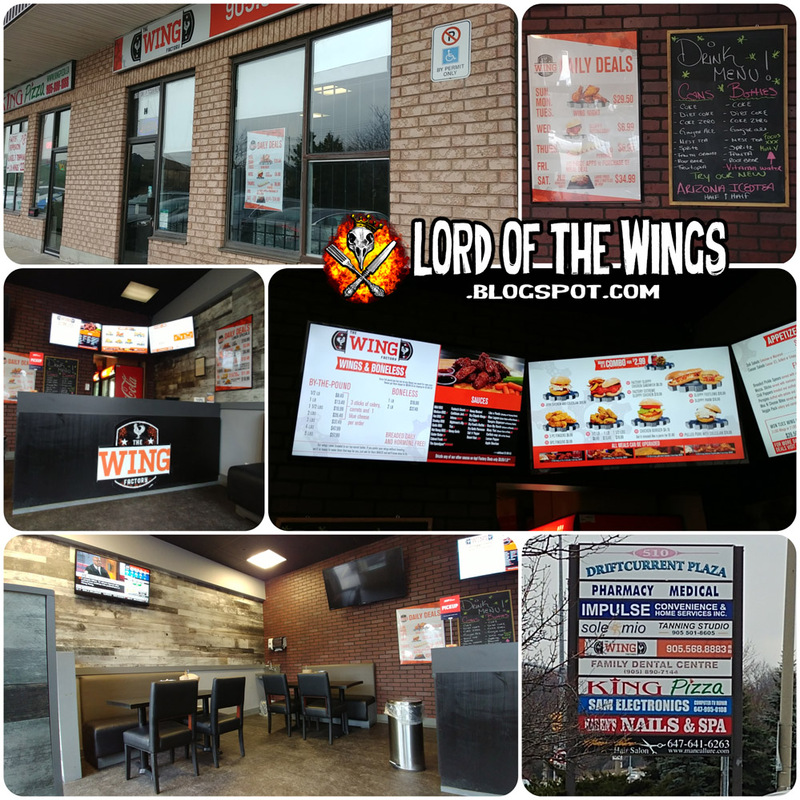 I was going to be having lunch and I did some research about wings in 'Sauga, and I came across Wing Factory. 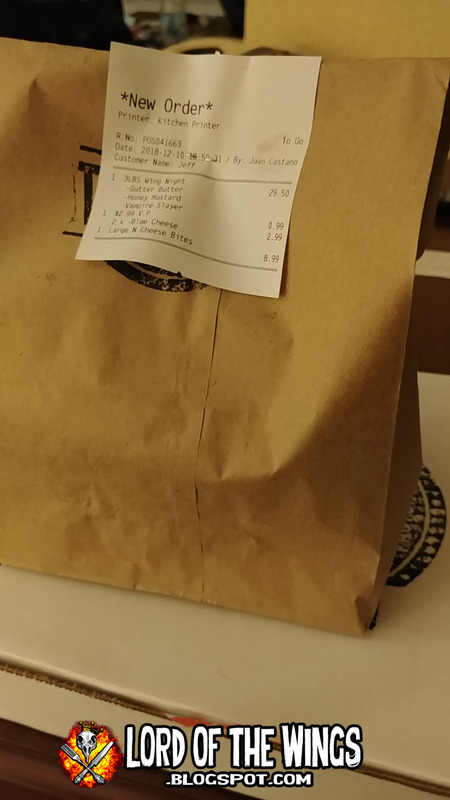 I was a bit confused at first because the same address coming up for The Wingery, a small local chain that I have been to before (but didn't review) many years around. It turns out this location of the Wingery closed, but in it's ashed arose Wing Factory. 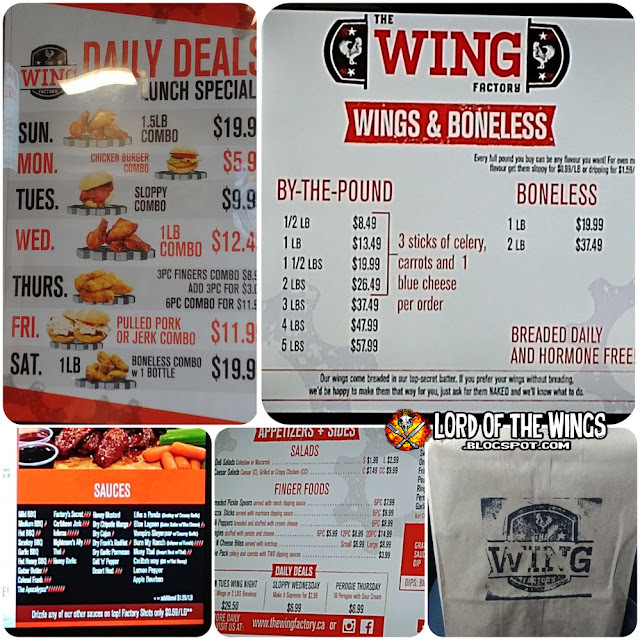 Now it seems to me that realistically, the folks at Wing Factory copied everything that The Wingery started in terms of the menu and the wings. But I haven't done enough sampling to say for sure. 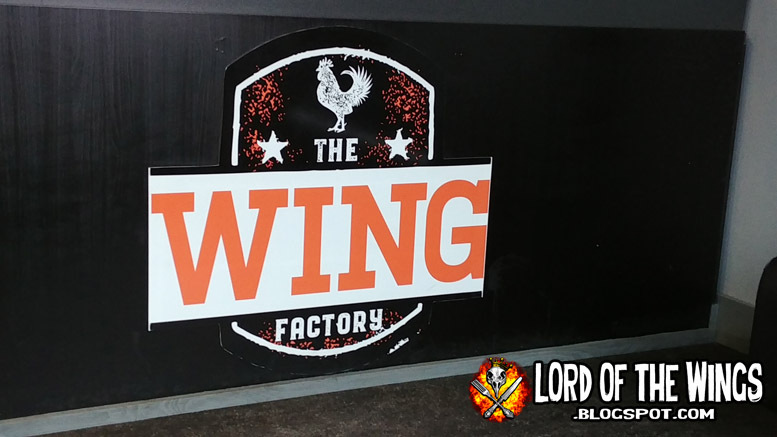 The Wing Factory is located in a strip mall nestled in between a pizza place and a convenience store. Now this is a take-out place but they have gone all out inside to make this a restaurant experience. They have rustic/urban/fancy decor with two tables and TV's that one can watch a game and hang out. I really dug it. I debated getting my wings to go or staying in, but I opted to eat on the go. Wings are obviously the focus here. There are 30 flavours of wings to choose from! Yes, you can get chicken burgers or salads or fries etc etc. 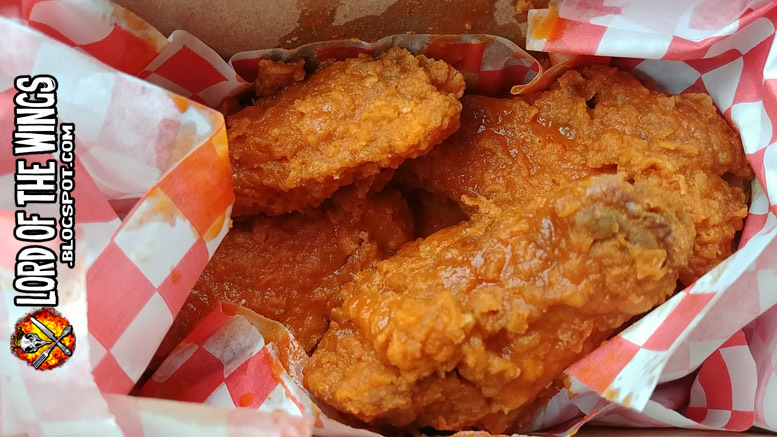 but really, you really want the wings. I went in and the Wing Dude at the counter was waiting for me and ready to answer all my questions. Checking out their website I knew going in there were a lot of sauces to choose from but several of the sauces had no descriptor. 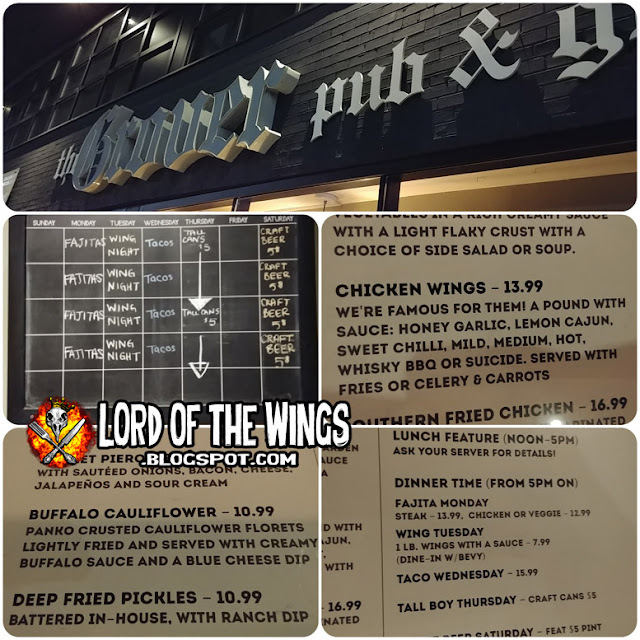 Wing Dude saw me scanning the menu and told me the best sellers are the Hot Honey BBQ (half Hot BBQ & half Honey Garlic) and Gutter Butter (their Buffalo style sauce). 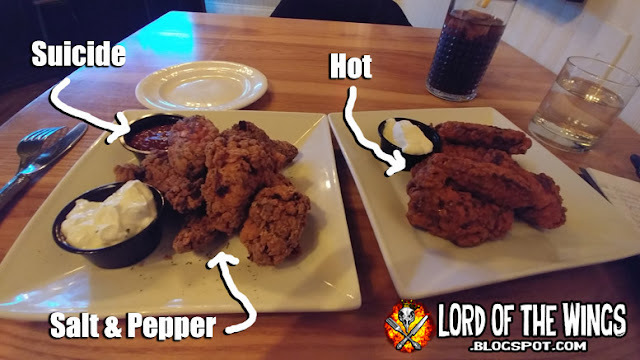 I asked about Colonel Frank (he said it was based on Frank's Xtra Hot) Factory Secret ( Colonel Frank & Caribbean Jerk, 'very flavourful and is a bit strong') Nightmare Alley ( 'One of our hot sauces, in top 3. 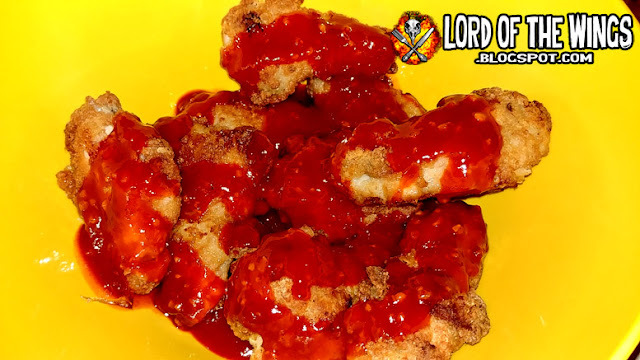 Own recipe, has powders, cayenne, direct chili powder. It also has the Colonel Frank). There was quite a bit to choose from and in the end I went really simple (after making him give all those explanations!) 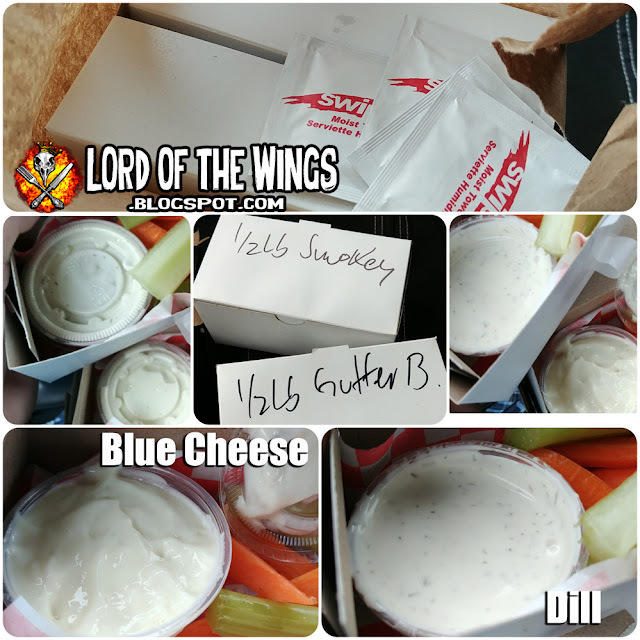 with a Spicy BBQ and their Gutter Butter sauces. Wing Dude went into the back and got everything prepared. He also asked me if I wanted Blue Cheese Dip, or something else? I said blue cheese but then asked what were my other options? He said there was also Ranch, Creamy Garic, Sour Cream and Dill. I was like, can I get 1 Blue Cheese and one Dill? He was like, yes you get two so we can mix. Awesome. Shortly after I had my order. It came in a tall, not wide paper bag. At the top was lots of napkins and wetnaps (nice). Then there were two little boxes; I pulled them out and there was celery and carrot sticks and my two dips. The veggies were nice and fresh with a good snap on them. I tried the Dill dip and it was really dilly, like fresh dill taste. It was good, but just on the verge of being too watery. But then I had the blue cheese. It was so good. It was creamy, thick, and tasted so good. There were no chunks of actual blue cheese, but that's ok. It was so good I could drink it. Ok I did drink it. You would too; I'm not a monster. Beneath those mini boxes were two larger boxes that I was very excited to break into. 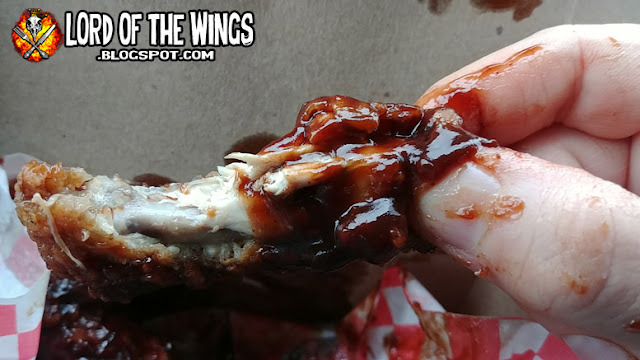 When I first entered Wing Factory, I saw the smallest order of wings was $8.49 for a 1/2 pound, and I asked the Wing Dude, how many wings roughly come in a 1/2 pound? He said 4 and he knew that that didn't sound like very much. 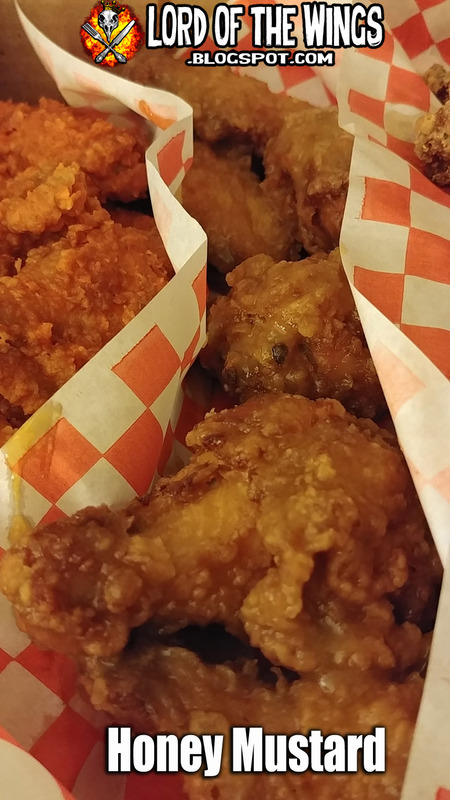 He told me that their wings are much larger than average, and that the drummette alone can be the size of a drumstick. He was right. 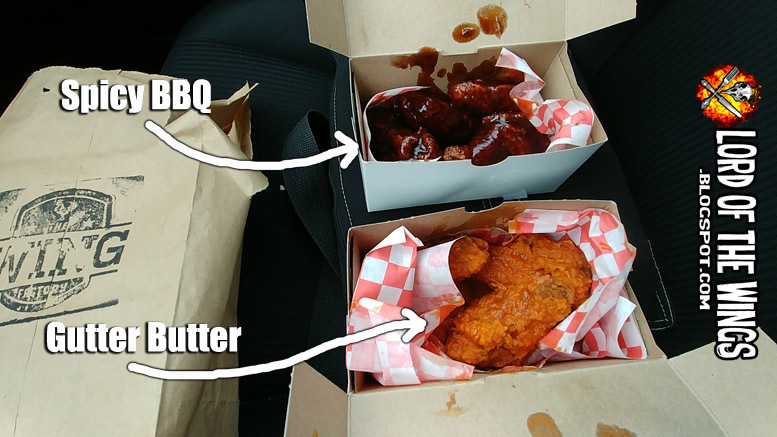 One box had 4 wings and the other had 5, but man oh man were those wings HUGE. Jumbo. And to boot, the chicken was fresh and locally sourced. Wow. Did I mention these wings were giant? Length wise yes, but they were so meaty each one was heavy to lift. My pictures do not do them justice. I actually had a hard time holding some of them up with one hand. 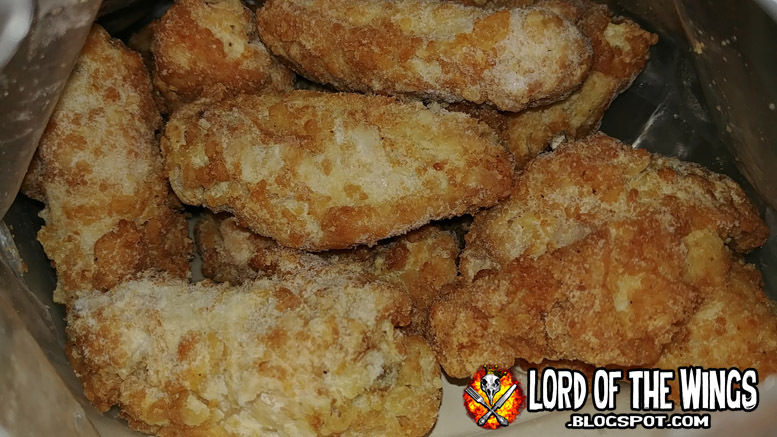 The wings are also breaded and then deep fried. 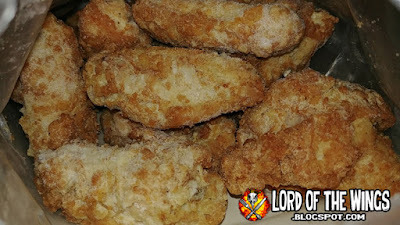 The breading is crumbly (in a good way) and held up to the sauces pretty well. 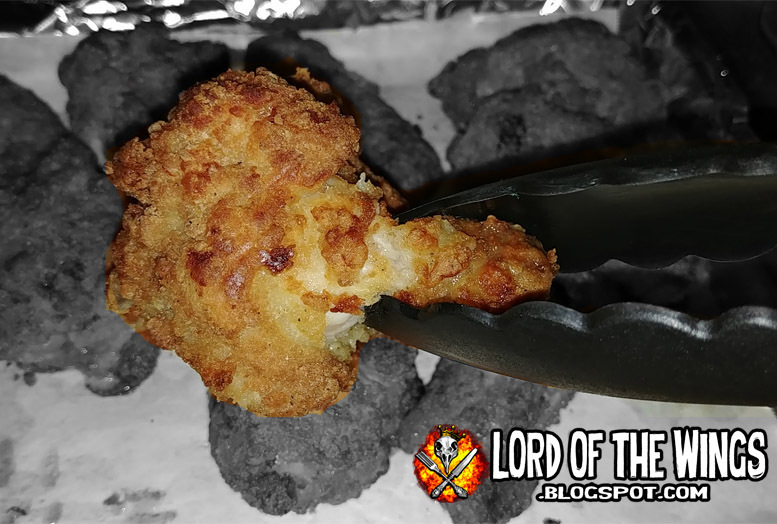 The wings were also deep fried just right so that the skin/breading was crispy, but that the meat inside was cooked just right. This is really an art as when you have wings this meaty, to cook them enough you've got to fry them longer, which can lead to over-fried skin/breading, dried out meat, or over/under cooked meat. These were none of those things. The meat was on the verge of being tough though, but it didn't go over thankfully. 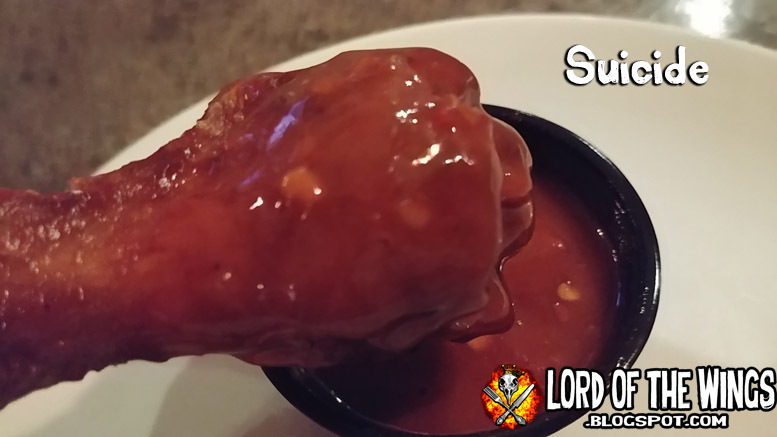 As for the sauce, the wings were very well sauced. Each wing was wet and sat in a small puddle of extra sauce. In fact there was so much sauce that it was nearly impossible to eat cleanly. The walls of the box had so much sauce that my hands could not grab a wing without getting sauce on them to begin with. I'm cool with that, but neat freaks be warned. With all the flavours to choose from, I went with two simple ones. 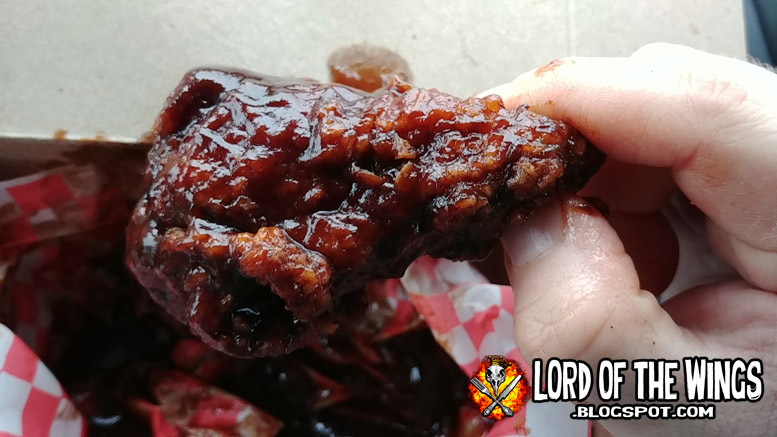 I wanted to see if the basics were good, so I went with Gutter Butter and Spicy BBQ. Also, those are probably my favourite wing flavour profiles anyway. 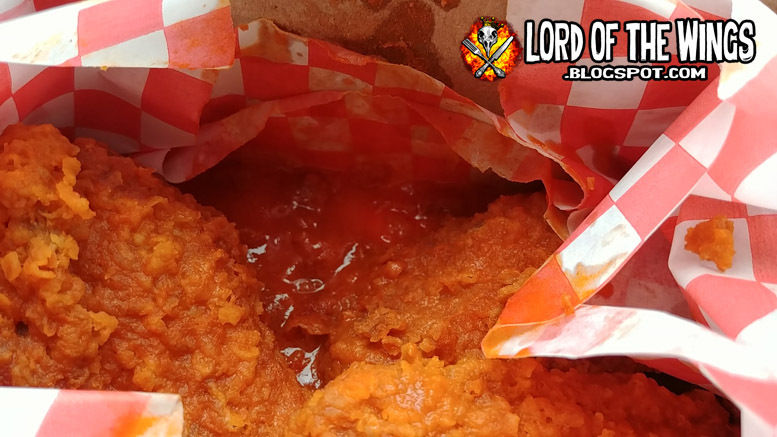 Wing Dude described this as their version of Buffalo sauce, and it tasted like everything you want Buffalo sauce to taste like. It was rich and buttery, so that was awesome. But it also had a good bite to it. It had a sting and was actually hot. Spicy and buttery. It was just really really good. This was also really good. It was everything you want in a Spicy BBQ sauce. 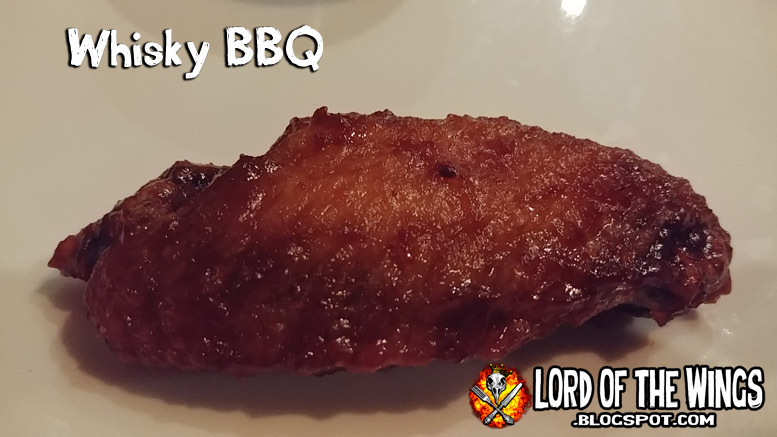 It had all the flavour, but it was also sticky, thick, not quite gooey, but oh so good. There was a sweetness to it, but also had that dark savoriness. It had a hint of smoke. The texture, the flavour, oh this was a good sauce. Well, it was wing night, and after some convincing, I was in. 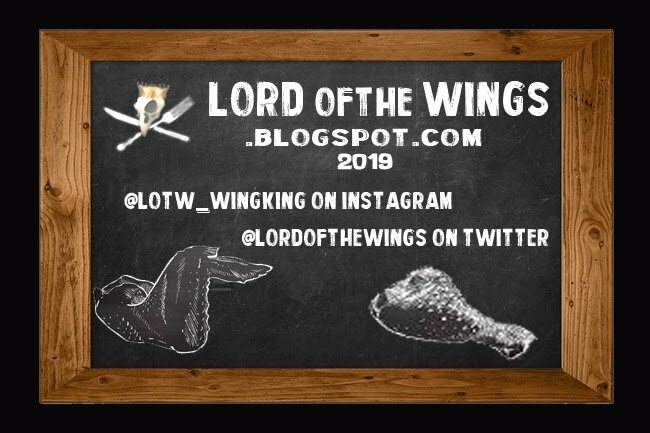 We decided we get their Tuesday deal which is 3lbs of wings for $29.50 (normally $38) and we would chill in our hotel room and watch TV and eat wings. 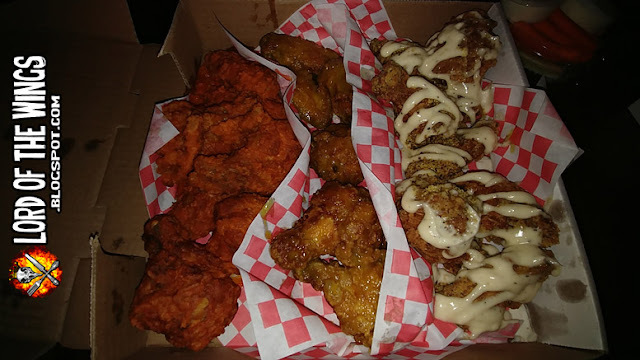 I called up and got the same Wing Dude as lunch. I asked if we could split the flavours and he said we could get 3 flavours. I asked if it came with veggies and he said no but you could add them for $2.99) and we also got some Mac & Cheese bites. 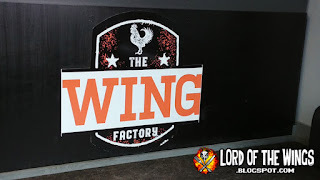 We went to The Wing Factory and I went in to pick up the order. It was Wing Dude #2, but I could hear the original Wing Dude in the back. 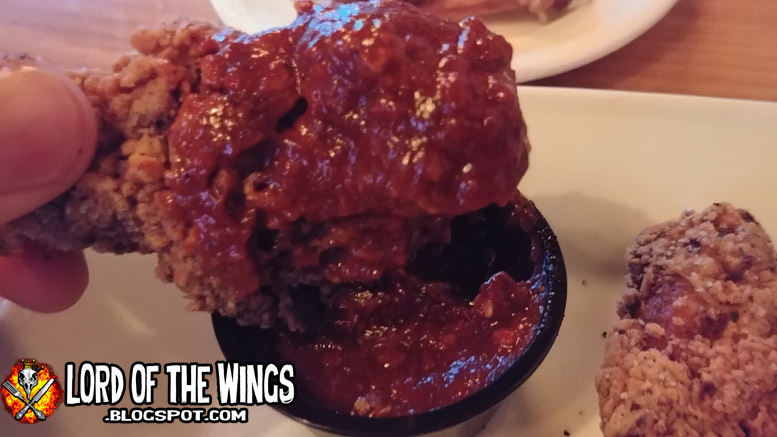 Wing Dude #2 was like I'm just about to sauce your wings. He came out shortly with my big paper bag and we scooted back to begin our feast. 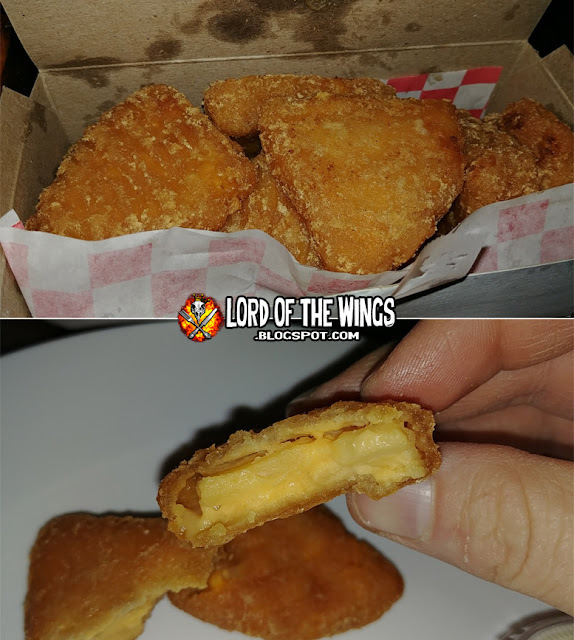 We got an order of Mac & Cheese Bites ($8.99) which didn't seem like a big order, but there was about 8 nugget sized pieces. They were cheesy and crispy, but I found they needed a dip for sure. More veggie sticks (for health) and more blue cheese. This was great. We went with 3 different flavours this time. We got Gutter Butter again, because it was awesome. 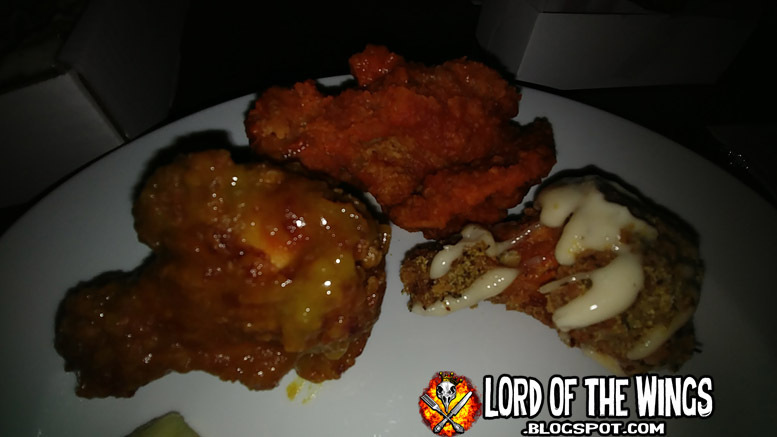 We also went with Honey Mustard and Vampire Slayer. Ya! Cool name for some cool wings. 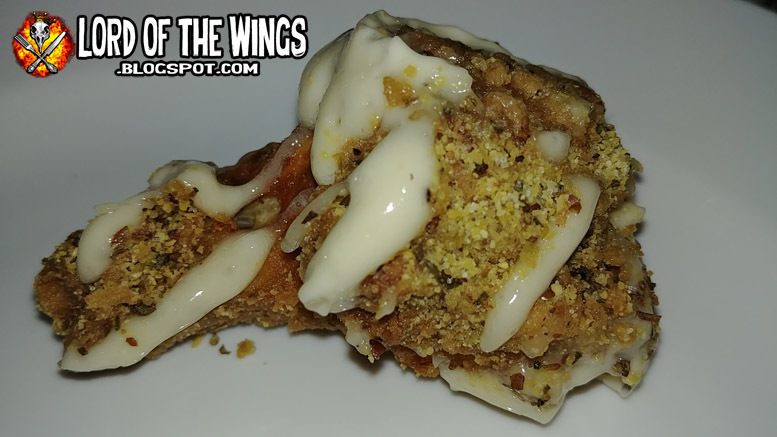 These were the breaded wings tossed in a Dry Garlic Parmesan or DGP as they call it) and then thickly drizzled with Creamy Garlic sauce. 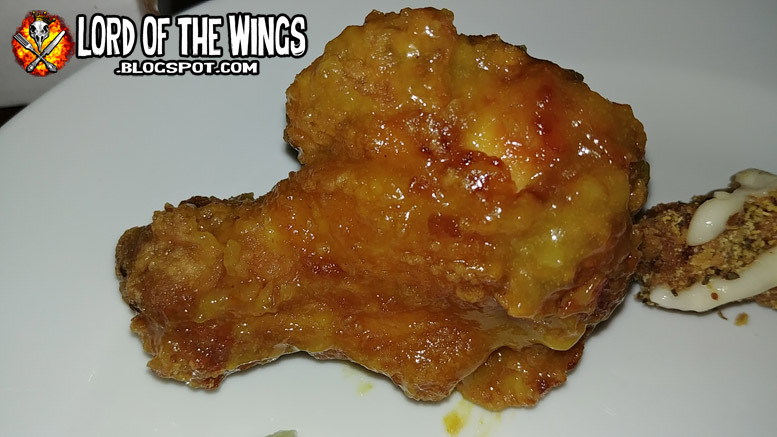 This was a great hybrid wing - part dry part wet. Now this did not put a stake through my heart; I was expecting a STRONG garlic flavour, but these weren't that strong. The Seasoning was nice, but mild, and the garlic sauce was nice and creamy, but again, mild. This was a nice wing but I wouldn't order it as my only choice - it was nice in our sampler box. 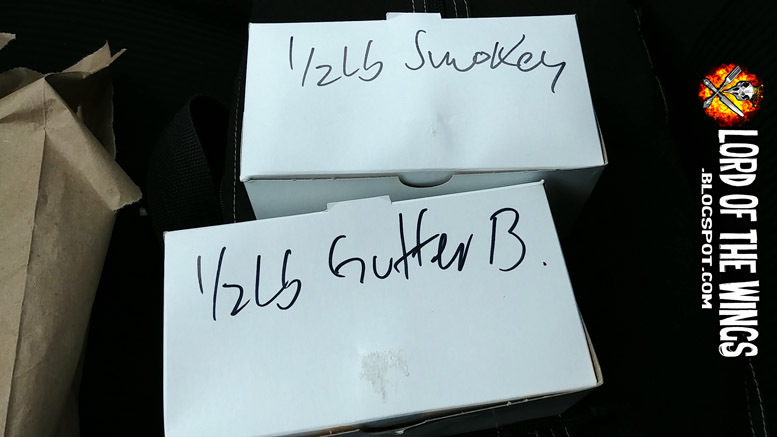 This was exactly what you expect (or at least I expect) when you get Honey Mustard wing sauce. It tastes like honey and mustard. The sauce is thick, it's honey sweet, with that slight mustard pungency. But it doesn't taste artificial like some HM sauces. I liked it but it was not LJ's fave.